2015 saw a Durham University student take the top spot in the national Student Employee of the Year Awards; an annual competition which celebrates student employers and employees from across the country at local, regional and national levels. Adam Hughes, a second year Music student at Durham University, was nominated for his work as a Telephone Fundraiser by the University’s Development & Alumni Relations Office, and after successes at institutional and regional level he was awarded the overall Student Employee of the Year Award at the national awards dinner in Liverpool. His prizes included £200 prize money and the opportunity to attend the Student Employee of the Year Winners Emerging Talent Programme. 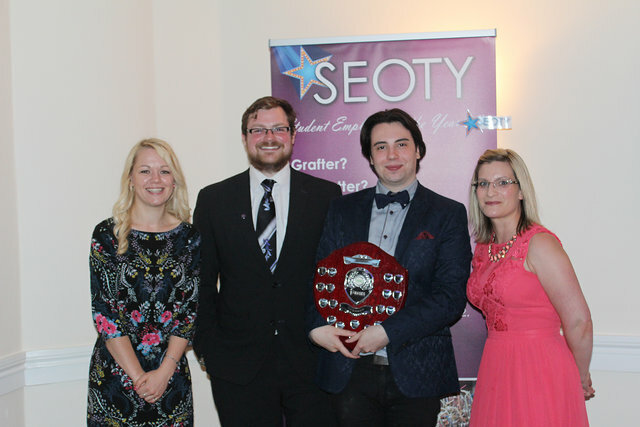 The Student Employee of the Year Awards are coordinated by the National Association of Student Employment Services (NASES) and 2016 will be the fourth year that Durham University has taken part in the competition. We would love for more local businesses to get involved, celebrate your employees’ hard work and guarantee an invite to Durham’s institutional awards ceremony! The 2016 competition promises to be bigger and better than ever, and we would love for a local student and their employer to win the national award for the second year in a row! Businesses can nominate student employees in a range of categories including Above & Beyond, Step up to Leadership and Commercial Impact. There is also a category for students to nominate an outstanding employer, so if you’d like to show your appreciation to the students working for you and raise your profile on campus at the same time, this is the perfect opportunity. You could also be crowned Student Employer of the Year! Nominations for this year’s awards will open on Monday 22nd February, however if you would like to register your interest early then you can do so by emailing ses@durham.ac.uk and we will send you a full nomination pack including information about categories, eligibility criteria, closing dates and prizes. We will also send information about how to nominate an employer directly to any students working for you!